« NTP server – Introduction to Network Time Protocol. Network Time Protocol is a hierarchical protocol and is divided into stratum which define the distance from the reference clock. A reference clock source that relays UTC (Coordinated Universal Time) time and has little or no delay is known as a stratum-0 device. Stratum-0 servers cannot be used on the network, instead, they are directly connected to computers which then operate as primary time servers. A primary server that receives a time signal from a stratum 0 device either through the GPS network or national time and frequency transmission is known as a stratum-1 device. On a network a stratum 1 time server supplies the time to other devices on the network which are known as stratum-2 devices. These also can be used as a time source and equipment that connects to a stratum-2 device to receive it become stratum-3 and so on. NTP can handle up to 16 different stratum levels, although the lower down the hierarchy you go the less accurate the devices become. However, to make the system more reliable, each client can receive a time source from multiple servers. Stratum 2 devices and below can also synchronise with each other. The NTP software monitors continuously the figures of stability and accuracy of all the servers and always chooses a server with the best figures. 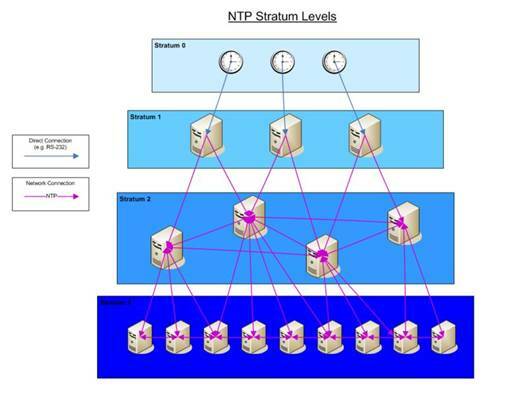 Multiple stratum are used an in larger networks because to bombard a single stratum-1 time server with NTP requests from thousands of machines could cause it to overload or block the network itself with workstations/routers etc repeatedly waiting for their time synchronisation requests to go through. Stratum 1 time servers connected to a stratum 0 source, stratum 2 servers connected to stratum 1 and stratum 3 connected to stratum 2.